Mass transit is a critical mode of transportation for many New Jersey residents. Considering the expense of cars in New Jersey, the ease of access of mass transportation, and its appeal when it comes to being environmentally friendly, it is understandable why thousands of people every day ride the bus, take the train, or use the subway to commute and travel. As a society, we expect these modes of mass transportation to be safe not only for passengers, but for all drivers and pedestrians as well. When we place our trust in drivers, conductors, maintanence and support personnel, dispatchers, and the entities that run these services, and those same entities break that trust and cause injury, it is important that the injured party recover financial compensation for their medical expenses, lost income, and their emotional and physical pain and suffering. At Kamensky, Cohen & Riechelson, our attorneys have been helping parties injured in bus accidents, train accidents, and subway accidents to recover the financial compensation they need and deserve in personal injury claims since 1972. We have already recovered millions of dollars for clients across New Jersey and Mercer County towns like Trenton, Princeton, Hamilton, and Lawrence, and we are ready to put our experience, legal knowledgeable, and highly effective service to work for you today. Contact our firm to discuss your bus or train accident, and your options for recovering compensation in a free and confidential consultation today. The dangers that fast-moving, heavy objects like buses and trains can pose are obvious to anyone. 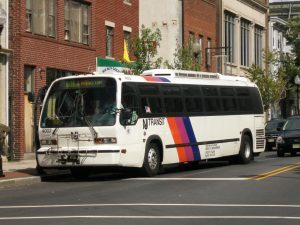 For this reason, there are a great number of safety protocols, regulations, and established operating procedures for bus operators and train operators alike (typcially regulated in New Jersey by NJ Transit). In all of the above examples, injuries resulting from any of these scenarios could and should have been prevented. When these negligent or reckless actions cause injury you may be able to, along with the help of our experienced Mercer County bus and train accident injury attorneys, recover compensation for your medical expenses, lost income, and physical and emotional pain and suffering through a personal injury claim. If you have been injured in a bus or train accident, there are two potential avenues for recovering compensation. For injured parties who are employed by the mass transit service which caused the injury, you may wish to file a workers’ compensation claim. Workers’ compensation claims have the advantage that no fault needs to be proven in order to recover compensation, but the disadvantage that pain and suffering damages cannot be recovered, typically representing the greatest portion of financial recovery in a personal injury claim. The injuries you have suffered were directly caused by your mass transit accident. So not only is it important to your health that you seek medical attention immediately following any kind of accident, it often greatly helps to increase the strength of your personal injury claim. The bus or train accident which caused your injuries was the direct result of the negligence or recklessness of a responsible party. The extent of the damages your are claiming are accurate and necessary. While these requirements for a successful bus or train accident personal injury claim may seem fairly straightforward, the validation of these elements is often much more complicated than they seem at first glance. Proving that your injuries are directly related to your bus or train accident, that those injuries resulted from the negligence of a responsible party, and the full extent of the damages you have suffered as a result of your accident often requires the help of an experienced personal injury attorney. With this in mind, it is important to remember that not only do our personal injury attorneys work on a contingency fee basis (meaning you do not have to pay for our services or the expense of your claim until a recovery is secured), but also that while you will eventually have to pay for your attorney’s services if you secure a recovery, the greater total amount of recovery that an experienced attorney can secure for you will often cover the cost of hiring an attorney in the first place, and often much more! Especially considering the fact that without an attorney, you run an extreme risk of not being able to secure a recovery at all, speaking with an attorney regarding your options for recovering compensation for a bus accident injury or a train accident injury is a win/win scenario. At The Law Office of Kamensky, Cohen & Riechelson, our attorneys have extensive experience successfully recovering compensation in personal injury claims of all kinds for clients across Trenton, Princeton, Hamilton, Lawrence, Mercer County, and throughout New Jersey. We believe that by listening closely to each of our client’s specific needs and concerns, and keeping them highly informed and involved through the personal injury process, we can better work to secure the exact type of resolution which best meets those needs and concerns. Insurance companies across the state of New Jersey recognize the high level of service we provide for our clients, and our preparation and willingness to go to trial, and as such tend to be much more open to negotiation, and ultimately offer settlements which are fair and reasonable for your bus or train accident injuries. To speak with our personal injury team today in a free and confidential consultation regarding a bus accident injury, train accident injury, your options for recovering compensation, and how specifically we can help you to do so, please contact us online, or through our Trenton, NJ office at (609) 528-2596.